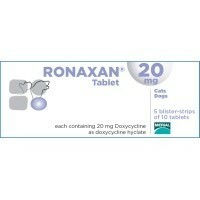 Ronaxan tablets contain doxycycline, as doxycycline hyclate. Indicated for the treatment of respiratory tract infections in cats and dogs, including rhinitis, tonsillitis, bronchopneumonia and feline respiratory disease. Used your company for the first time and generally impressed. Would have liked an email though to say that my order had been dispatched.